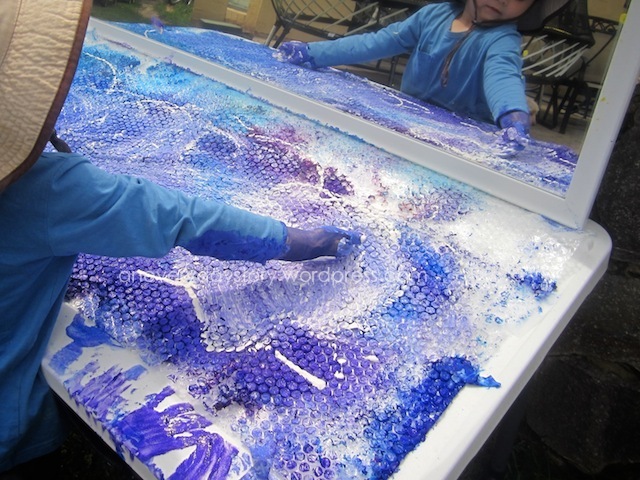 Painting with bubble wrap was one of Jack’s (3.5yrs) first sensory painting experiences. He loved it then and he still loves it now. Sometimes I like to add some paper for printing but most of the time he simply enjoys running his fingers over the bubbles and through the paint. We are loving this gorgeous Spring weather, we’ve all but moved outside. I moved the art table outside and set up this simple activity for the kids. Actually the art table has been outside all week. It’s been great, I’m not sure why I didn’t think of it earlier. Jack and Sarah (18mths) can explore for as long as they want and I don’t have to worry too much about the mess. I think I may just leave the table out there. I love having the mirror there though. Even though we use mirrors a lot, they still seem to intrigue Jack. He watches himself paint, watches his hands move back and forth. It’s just as fascinating for me to watch him; the look on his face as he tries to direct his hands by watching his reflection. That’s what I love about mirrors, the way Jack interacts with them. You can see him thinking differently. I hadn’t given Jack bubble wrap painting on this scale before but you can tell by the amount of paint that he enjoyed this just a little. 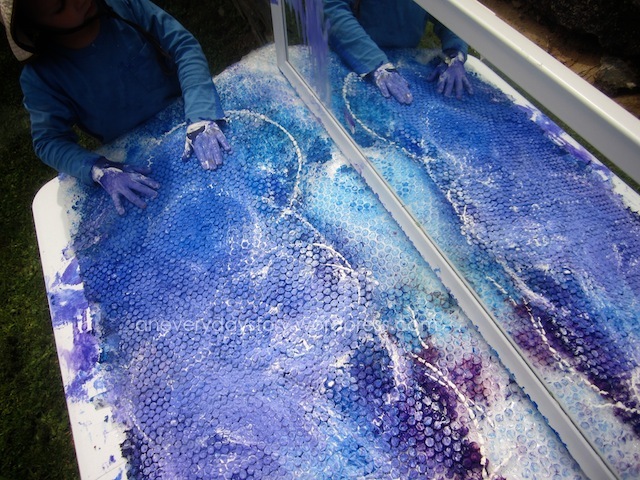 I taped the bubble wrap to the table then squirted circles of paint. Then when they were finished for the day, just hosed it off ready for tomorrow. I like to leave activities out for the kids to return to until their interest wanes. This could be a day, or a week or in some cases, ongoing. You never know. 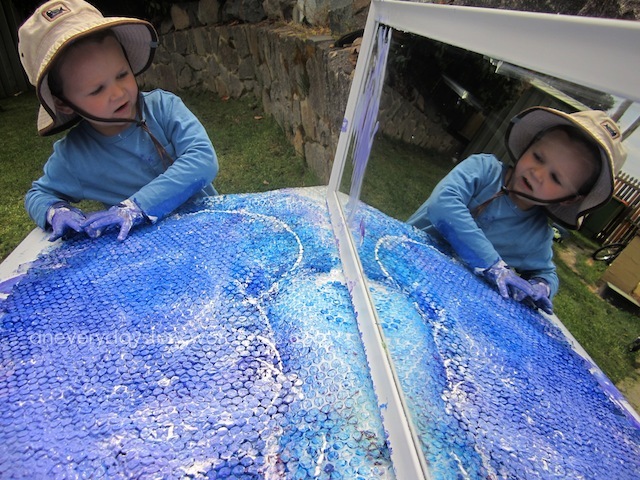 Hi … I love to see the lovely stuff you do with ur superlovely kids in the Reggio way!! I am a kg atelierista in Dubai and I am quite new to Reggio! Your work seems fun and inspiring. My school follows a Montessori + Reggio approach. I being the atelierista have to do literally 100% Reggio, with my kids. Id like to know what do u do after the bubble wrap painting.. do u wash it and re-use it or display it! Hoping to get lot of help and inspiration from you. Your doing a great job! Thanks Hiba. What a wonderfully fulfilling job you have. With most open-ended activities like the bubble wrap, I will leave it out for the kids until their interest wanes. Sometimes I will add a new material to reignite their interest or present it a little differently to see if they approach it in a different way. 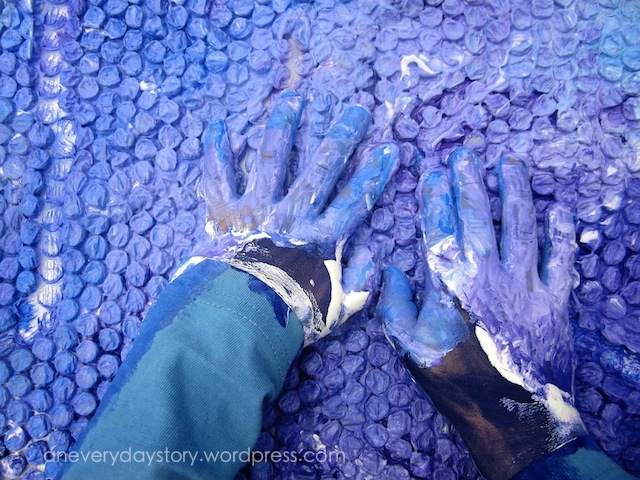 With the bubble wrap, we simply hose off the paint at the end of the day ready for the next day. The colours and the textures are quite beautiful and I think you could definitely use it on display as a part of the documentation process along with some photos of the children working and maybe some transcripts from the children explaining their experiences. I just pulled the bubble wrap out of the trash. What was I thinking! Some old clothes. Three colors of paint (for mixing). Three kids. I am seeing a good time killer and cheap entertainment. I mean, a wonderfully perfect Reggio art experience. Thanks! haha yes, a wonderfully perfect Reggio art experience 😛 I’m sure they loved it. Mine certainly do. Whoah, that’s super cute. The bubble wrap idea is just genius, you’re kid’s having a lovely time with it. The colors really blended well, thanks for sharing this with us. Ooohi want to join in too!